Known internationally as 'Mr Share Holding', the economist Li Yining has had a transformative impact on China's economic transition, most notably as an early advocate of ownership reforms in the state and other non-private sectors and in his promotion of shareholding theory, initiating the drive towards a modern corporate system in China. The thinking behind these and other landmark contributions that have helped to reshape China are featured in Economic Reform and Development in China, a collection of sixteen influential papers written and published during the reform period, from 1980 to 1998. Incorporating original research, policy proposals and theoretical thinking, these papers trace the development of Li's thought and the process through which the 'China Miracle' has been worked over the last three decades. 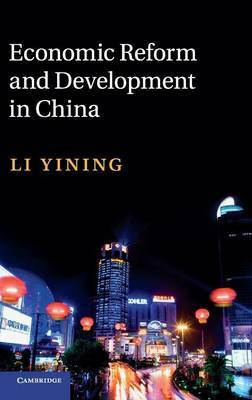 This newly edited translation introduces how inextricably linked Li's academic work has been to the development of a distinctively Chinese path of economic reform.